Jason Statham as Chev Chelios and Bai Ling as Ria in "Crank High Voltage." Bai Ling at the debut of Jaime Presslys Spring/Summer 2008 Jaime Collection. Bai Ling at the Los Angeles launch party for interior designer Kelly Hoppens book "Home - From Concept To Reality." Bai Ling at the Yves Castaldi Spring 2008 fashion show during Mercedes Benz Fashion Week. Bai Ling at the Jaime Presslys Spring/Summer 2008 Jaime Collection. Bai Ling at the premiere of "30 Days of Night." Bai Ling at the amfARs (American Foundation for AIDS Research) Cinema Against AIDS 2007 annual event during the 60th edition of the International Cannes Film Festival. Bai Ling at the Mercedes Benz Fashion Week. Bai Ling at the Movie meets Media Event. Bai Ling at the official launch of Ubisofts "Assassin's Creed." Bai Ling at the 50th Grammy Awards. Bai Ling at the Helio launch summer party of "Ocean" to benefit Heal the Bay. Bai Ling at the INSPIR(RED) event. Bai Ling at the premiere of "Oceans 13" during the 60th edition of the Cannes Film Festival. Bai Ling at the Black Eyed Peas 4th Annual Peapod Foundation Benefit Concert. Bai Ling at the Los Angeles Confidential Magazine and Niche Media's celebration. 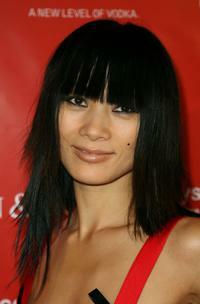 Bai Ling at the screening of "Southland Tales" during AFI FEST 2007. Bai Ling at the premiere of "Somebody Help Me."